There are many different types of coffee beans growing in various countries and regions around the world. In fact, there are thousands of different coffee bean types, but most of them are not being cultivated and marketed for coffee consumption. Coffee bean types differ in their characteristics. Flavors, aroma, body, acidity and other qualities of the coffee beans will be different based on the places where they grow. However, origin flavors are preserved mostly in light roast, as darker roasts eliminates them. Some types of coffee beans have higher level of caffeine in them than other types. Of the several dozens of major coffee bean types available, the two top cultivated coffee beans are the Arabica beans and the Robusta beans. 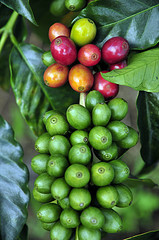 Both coffee bean types have sub-types. Arabica or Robusta beans differ in their qualities from place to place. Kona coffee beans, Colombian coffee beans and Brazilian coffee beans are some of the Arabica coffee bean types much marketed around the world. 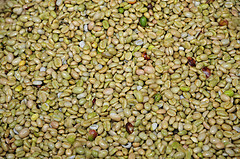 The Arabica beans are of higher quality and are less bitter than the Robusta. Robusta beans are often used as a blend to add body to gourmet coffee drinks produced from Arabica beans. The Arabica beans are harder to grow as they are more vulnerable to weather conditions and plant diseases. In Colombia, coffee plants have been much affected of wet weather conditions that caused leaf-fungi attacking the coffee beans. Learn more about Arabica coffee beans and Robusta coffee beans. Add Your Comments On Coffee Bean Types?